This condominium is privately owned and you are renting directly from the homeowner who's company name is Paradise Rentals LLC (as will appear on your credit card statement). Therefore reservations are not transferable between units. A $500 security deposit is required with this reservation and we may process a credit card authorization in that amount prior to your arrival. A charge may result for fines or damages to the condo, missing contents or for exceeding the stated number of overnight guests. If a guest arrives without notice earlier than the scheduled check in time of 3pm or fails to depart by the required 10am checkout time, their security deposit which is on hold will be charged in full. Our units hold very busy time lines and the failure to leave on time can cost money and schedule disasters. Likewise arriving earlier than scheduled can disrupt the busy cleaning flow, cause mishaps and confusions with the housekeeping staff. Damage in excess of the $500.00 security deposit will additionally be charged to your credit card commensurate with such damage. Guests are responsible for reporting any damages immediately to on-island contact Graeme D. Merrin, RB, ABR, GRI, 808 822 0272 or graeme@graememerrin.com. A maximum of 6 guests may occupy a 3 bedroom unit for the regular nightly rate. Guests are obligated to disclose the actual number of occupants prior to arrival. At no time should any one sleep on sofas other than sleeper sofas that are opened up and have sheets on them. A pack-n-play and high chair are available at no extra charge, but must be requested via email to alohacondos@vacationrealtyhawaii.com at the time of booking or with reasonable notice prior to arrival. Cleaning fees are based on a 5 hour clean. If the condo is left excessively messy and it can’t be made rent-ready in 5 hours, guests will be charged $37.50/hr for the additional cleaning. Parking: This unit has a single car garage to use as well as one outside space. Parking in the driveway to the garage is not allowed. A parking pass will be located in the unit next to the extra house keys. While parking in the outside space you must display the parking pass. A lost pass will result in a $75 dollar fine. SUNTAN LOTIONS, AFTER-SUN LOTIONS AND RELATED PRODUCTS LEAVE BLEACH-LIKE STAINS IN FABRICS. PLEASE BE CAREFUL WITH OUR UPHOLSTERY AND BEDSPREADS. We use white towels and white sheets for this reason, but it is not practical to have white sofas and bedspreads. Please shower before getting into bed, and please sit on a towel if you have sun products on your skin and you want to sit on the upholstery. Wash hands thoroughly after applying sun products to avoid accidentally damaging fabrics. Guests are responsible for damage to linens and upholstery from products they use. There is a $25 charge for a ruined towel. Smoking is strictly prohibited in the condo or on the condo lanai and doing so will result in full loss of security deposit. We have covered lanais, so the smoke gets trapped and blows into the unit. If you smoke away from the unit on the grounds of Plantation at Princeville, please be sure the dispose of your cigarettes appropriately, but not in the condo. Central air conditioning is available free of charge, however the vents are located only in the main living area and master bedroom. Please note some units have temperature controls to prevent the a/c from being set below 75 degrees. Please know that Kauai has the most expensive electricity on the island and condo electric bills run between $450 and $700 a month. Please help us to conserve electricity and keep our rates down by turning off the a/c when you are not home, keeping blinds closed during the day to keep the condo cool, and keeping windows and sliding doors closed when you are running the a/c. We provide sheets for each bed and two bath towels per stated guest. There is no daily maid service, but you are welcome to use the washer/dryer in the unit. If you have an interim clean included with your reservation we will launder the linens during the clean. Please make sure that all keys, towels and remotes are left behind at the condo when you depart. We charge a $50.00 replacement fee for each lost key and a $75 replacement fee for a lost garage door remote. Generally these are lost because they are left in the rental car, so please check your car carefully before you leave for the airport. The illegal presence, possession or use of non-prescription drugs or other controlled substances is not permitted anywhere at Plantation. GUESTS ARE RESPONSILBLE FOR FOLLOWING THE HOUSE RULES OF PLANTATION AT PRINCEVILLE. Violation of the rules can result in fines, and guests are responsible for paying those fines. In severe cases if guests are permanently removed from the condo and from the grounds of Plantation by the homeowner, property manager, resident manager or the police the guest will not be refunded for rent paid for unused nights, even if the guest is prohibited from returning to the property. The resident manager of Plantation at Princeville is Dominic Bender. We are happy to have you as a guest at our community. This notice serves as a kind reminder that this community is made up of permanent residents and vacation rental guests. You should have received a full copy of our house and pool rules upon booking your vacation rental. Copies of the house rules can be located in the clubhouse. The condo 1221 couldn't have been nicer! We loved our stay there. I had my daughters and their toddlers with me and it was like being home...every amenity you could possibly need was there. It was so beautifully decorated and well stocked with towels, beach goodies and even beach toys for the babies. We especially loved spending time on the lanai enjoying the island breezes. The beds were extremely comfortable, kitchen well appointed, and the furniture throughout was some of the most comfortable I've ever experienced in a rental. We would recommend this condo to anyone and will rent it again on our next visit to Kauai. Kristen was a doll to work with and took care of our every need. All around delightful experience! This luxurious condo with all the building upgrades is perfect for those who love fantastic sunset views over the mountains. Central air conditioning cools the master bedroom and main living area directly. Overstuffed chairs with footrests on the lanai create the perfect place for enjoying coffee in the morning and mai-tais at night. The custom furnishings throughout the condo create a luxurious tropical aesthetic. Telephone with Free Unlimited Calling within the U.S.
Everything was perfect!! The condo was beautiful!! We had a wonderful week. This condo was absolutely one of the best places we've stayed. As previously mentioned by others, this place has everything you need and can think of. It was like our home away from home. The extra amenities are what put this rental at the top for me. Things such as the Tommy Bahama beach chairs and beach towels, cooler, surfboard, boogie board and umbrellas, to name a few. In the kitchen, there was everything you needed down to the oil, spices, coffee liners, sandwich bags, aluminum foil, storage bags etc. It was also great to have a washer and dryer in the unit and yes, even detergent was provided. I absolutely loved the decor of this unit. Everything was themed with the tropical island feel. I felt like I was in Pier1 heaven. The reason for rating this only four stars is because of several things: 1) the living room furniture needs new cushions or new couches all together. The padding seemed worn and wasn't that comfortable to sit too long; 2) one of the guest showers when used made this high pitched sound throughout your whole shower - annoying to say the least; 3) there should be instructions or noted in an email on how to operate the TV and going back and forth from cable TV to Netflix, Hulu & Amazon. It took us a few days to figure it out. It also needs to be noted on how to turn on the Master Bath/Shower combo. At first, we thought it didn't work so we texted the island contact person to let him know. When we didn't receive a response a few hours later, I decided to call him instead. He said that the shower works perfectly fine and that he always gets this same complaint and he was sending the maintenance guy anyway to check it out. It turns out the bath handle needs to be pulled out to work...I was turning the knob (just like my bathtub at home). My suggestion is that if this is a common concern from renters, then perhaps it should be disclosed. Overall, I would definitely rent again and would recommend family and friends, as well. Thank you so much for all the wonderful comments on your review for the condo 1221 at the Plantation at Princeville. We are glad you felt there was everything you needed and you appreciated the design and decor. We do try to supply extra amenties such as the beach chairs for our guests convenience. The kitchen does have more than most vacation rentals hoping to put that extra touch. You mentioned the couch might need replacement but actually that couch is just a couple years old so it has been replaced already. We wish you would have let us know about the pitch in the shower as we could have had someone come by to take a look at that. The shower handle is pretty standard but maybe you just have not ever used one like it? For the most part shower handles turn left or right but if it is one piece handle, sometimes you have to pull out first. The TV cable is Spectrum so it works like the standard Spectrum remotes. The amenity included with the condo is just the cable TV. We do not offer the Netfilx options etc as those are all paid individually by any given person. If guests have a subscriptions to features such as Netflix, they are ususally familiar with those options if they use them often at home and with their own password and ID can usually pull them up on any TV. Thank you again for you feedback and we do hope you can come again! Was very nice and slept 4 single adults very comfortably - with room to spare. 3 bedrooms with a king, 2 twins and a queen, and each had its own bathroom, so could have easily fit 2 more people. Garage had some beach chairs and coolers that we were happy to have available to us. Will have to come back when the north shore past Hanalei is back open - had to drive a lot more than expected to other parts of the island, as we didn't know about the spring floods when we booked! I can't express enough about how much we enjoyed our stay at the Plantation at Princeville! It was our first trip to Kauai and staying at this condo was just like a home away from home! We were close to everything but just far enough away that it was quiet and peaceful! We loved waking up and going out on the lanai to see the mountains and palm trees and all the wonderful birds that would show up to visit. The condo was very well equipped with all we needed to cook meals and the washer and dryer allowed us to keep everything clean. We loved the furnishings and the beds were very comfortable.We were visiting for our son's wedding, which turned out amazing, and we had a few days to explore the island afterwards. We loved Kauai and definitely plan to come for another visit! I highly recommend this condo and we will stay here again for sure! Mahalo! This is a great condo and was perfect for our family. The living spaces were very comfortable, the beds were good and the kitchen was very nice, with everything we needed. The condo was also stocked with tons of amenities, like nice thick beach towels, boogie boards, snorkel gear and beach chairs. The in unit washer dryer was great and I really appreciated that detergent and dryer sheets were provided. There was Wi Fi, access to Netflix and Amazon Prime streaming for the TV and plenty of space for me + 3 teenagers. We used the community grill for dinner one night and the pool each day. The pool had a lot of rules and was crowded at times, but we go to the North Shore for the nearby amazing beaches anyway. At the price, this condo cannot be beat. I have stayed in other, more expensive condos, and they couldn’t hold a candle to this one. Plus, the location was excellent. We were very pleased with the unit. It was spacious, clean and well equipped. The outdoor furniture was very comfortable and much nicer than what we have had at other condos. The only items that could be added are oven mitts and some placemats to protect the glass tables. We have stayed at the plantations multiple times—in fact we have not stayed anywhere else on Kauai since we discovered them. Unit 1221 has probably been the nicest unit we have stayed in at the Plantations. It is well appointed and well maintained. This rental delivers just as advertised. It is spacious, clean and well stocked. The condo is perfect for family or multi couple use. There is a big difference between the master bedroom and the other two bedrooms (which are fine) so if you're sharing with other couples you need to take that into consideration. Dealing with Aloha Condos & Homes was very straight forward and their service was excellent. I had a little trouble finding the place but it was dark and I was not familiar with the area. We enjoyed our visit and I would rent this property again. The condo was everything we had hoped for, comfortable , clean and well equipped, with the exception of hand towels and face cloths. One per person is inadequate. I went out and bought some so we could go a few days between washings. Also, while the kitchen was really well stocked, there was only one teaspoon, which is certainly not a deal-breaker. We will highly recommend this condo to our friends and to anyone who asks. 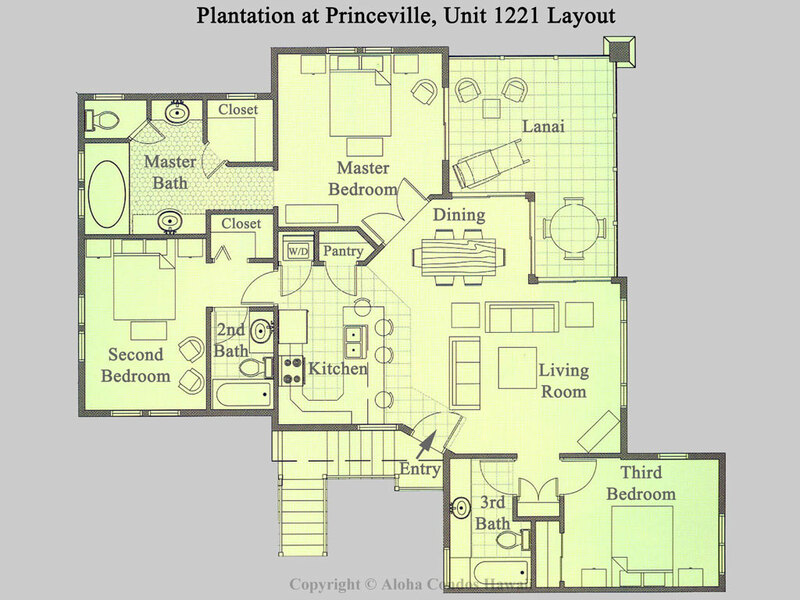 Thank you for posting a review for the unit 1221 at the Plantation at Princeville. We are happy that you found to be all that you had hoped for. It is a great and nicely upgraded unit. We are sorry you felt the supply of towels was less than you are used to. We do supply the 2 bath towels, on hand towel and one face cloth per person and have not had complaints about this. Also with the washer and dryer in the unit it is very convenient to refresh them if need be. We wish you would have let us know during your stay about the number of teaspoons as we would have brought you some more. We have made note to stock those in this unit. We are thankful for your recommendations and do hope you can come back too. Very nice Condo. Had a great time. Had everything stocked, even a surf board. If you would like a small suggestion, it would be to maybe add a set of bicycles to the already loaded arsenal of supplies and gear to make your stay there perfect. Thank you for everything, would recommend to all. My family had an awesome vacation time! The condo is absolutely great and in an excellent location. The rules are simple and as long as you are extremely careless, you won’t have a problem. It is equiped with everything you can think of to go to the beach and have a great time. We would definitely stay again if the opportunity comes up. Thanks for keeping it safe, quiet, and clean! Thank you so much for the wonderful review and taking the time to post. We are happy to hear your vacation was awesome and you would like to return. The unit is equipped well and makes for a great vacation! our stay there was very nice... quiet, fairly clean and relaxing. hotels and resorts are full of partiers, the only guests that came around were the Brazilian cardinals and doves! it was roomy and the garage was stocked with boogie and surf boards. Foodland was nearby so our "at home" dining was very convenient. Laundry was right there in the condo, so we were able to keep our clothes and towels clean and stocked. the gym was clean with good equipment, we used it everyday, pool was nice also... We used it several times. If we were ever to return to the island, we would stay there again. Thank you so much for the wonderful review. We appreciate your time. This is a lovely unit and is a very nice complex as are the amenities. We are glad to hear you would stay again and we certainly hope you do. The condo was exquisitely maintained, lots of kitchen amenities that are above what is normally expected (well supplied with spices, dishes & zip loc baggies), tons of outdoor toys (2 scooters, 2 coolers, lots of chairs, umbrellas, boogie boards...), comfortable beds & pillows. The location was very central to all activities and overlooked the beautiful pool. We were very impressed with the ease of payment & check in. The only drawback is the "No Fun" in the pool rules, but they are stated clearly in the advertisement so you know what you are getting. Wish the kids could have been able to be kids in the pool, but we understand how noisy that can get for the other residents. Anyway, we would love to visit again! Thank you for your wonderful review for the unit 1221 at the Plantation at Princeville. We try to think of all things that will help out the guest to have a great vacation and stock accordingly. It is a great location on the beautiful North shore. As you understand the pool area has to account for all guests and consideration and rules apply accordingly. Thank you for understanding. I guess the ocean is where they can make all the noise. We do hope you can visit again soon! Condo was better than expected; clean and plenty of room for the 5 of us. It was well stocked with everything we needed, even a blender. The furnishings were higher end and comfortable. The location is beautiful and convenient. I would definitely stay here again. It has everything you will need to enjoy this beautiful island! Trust me, it looks better than those photos! My family already decided to return every year to enjoy this beautiful island and beautiful home! AC was turned on for us right before we arrived. The condo was nice, clean, spacious (more spacious than we thought) and definitely much better equipped. Rice cooker, pots, pans, silverware, dishes, spices, condiments - they are all there. They even have a baby high chair. We enjoyed the patio so much that we literally had every single dinner there. Air con is definitely a nice plus because it was quite hot during the time we visited (end of August). It was very pleasant to come back from a sweety hike and turn on the AC. The location is very good! 13 minutes walk to Queen's bath (be aware of the mosquitos when you hike down to Queen's bath), a very short 10 minutes drive to Hanalei bay where you can find delicious restaurants and food trucks (we loved "Trucking Delicious" the best). A 4 minute drive to Foodland grocery store where you can buy your fresh produce for dinner. The owner and the manager Kristen are both so nice. My mother had a medical emergence (kidney stone... so painful) the day before our trip and I had to reschedule. They were super nice and willing to rebook the condo for another time window with no extra charge. Comfortable accommodations with great amenities. Amazing condo, well stocked and perfect location. Can't wait to return. Just would have liked to have some bbq tools, other than that it was a great place to make memories. We really enjoyed our stay in this condo. Everything was beautiful and everything we needed was there. Very roomy and great for our family of 4. The kitchen was well appointed. Master bathroom was amazing! We appreciate your review of the unit 1221 at the Plantation at Princeville. We do try to have all one would need for their vacation and are glad you agreed. We do hope you will come back again to paradise! Wonderful Vacation Rental in Princeville! The Condo at Plantation at Princville was awesome! Very clean and comfortable with a nice view of the pool area. Beautifully decorated too. Easy to get to and right by a market, just two minutes down the road. Grocery Store, coffee shop, ice cream, resturants, shops and more. We had everything we needed and more. There were 5 of us (3 teens) and everyone felt they had plenty of room. Beach towels were provided along with a great assortment of beach gear. The only thing someone might need is snorkel equipment. The location was wonderful with nice beaches close by. And it was just perfect Hawaii. We are so happy to hear your vacation went well. Thank you for taking the time to post a review. This is a great condo and thank you for noting the cleanliness and the decor. We are glad that you found the beach gear to be useful and a plus to have on hand. We do not supply snorkel equipment because it is too specific to individual sizes and with many pieces can be in need of replacement often as they can go missing. However there are many places that snorkel gear can be rented and very reasonably on the island. We do have great beaches and a beautiful island making a great Hawaiian vacation. Please do come again! We had a fabulous stay!! Just a couple suggestions -1) turn off the pool heater in the summer! 2)provide a shade on the inside or outside of the front door - the sun comes right in the glass door to the master bedroom. And that is it! We loved it and can't wait to come back. The value seriously can not be beat! Thank you so much for the great review! We are so glad that you found everything to be pleasing to you. Thank you for the suggestion for a blind on the front door. We will let the owners know about that but I also guess it is really relative to the time of year and how the sun is going down. We did more sight-seeing than staying in the condo, but our evenings and nights were marvelous. The amenities are superb! Thank you for a wonderful place to stay. Would recommend it to anyone. Mahalo for the great review you have taken the time to post. This unit is very accommodating and has all one would need for a home away from home. The amenities including the pool, hot tub and exercise facility are a plus! Thank you for your recommendations! This will be our second time in this condo. Traveling with two children 1221 is perfect. Plenty of room, very clean and well furnished. The owner obviously takes pride in the property. Standard condos supplies are supplemented with enough beach equipment to outfit the entire family. In addition everything you need if you have a toddler. I can't say enough about this condo. We can't wait to return. Honestly, I think this is one of the best deals I've ever had. Everything I expected from a condo (hotel amenities, full kitchen, kitchenware, dinnerware, washer and dryer, etc) and more. I didn't even notice the snorkel gear in the garage... I wish I had sine I needed the flippers. This property was worth every penny! The condo was very clean and nicely appointed. Only downside was that neighbors are right on top of you. Close quarters. Other than that, all good. Nice to have a garage. The unit had all the amenities we have come to expect on our Hawaii stays. For a second floor unit, there was a significant ant problem. We noticed their presence as we opened cabinets upon entering for the first time.We always keep food items in the refrigerator in Hawaii just to be safe. This unit needs some additional pest control implemented soon.The little ant houses stationed everywhere are insufficient. We were completely satisfied with Condo 1221. It was well appointed, comfortable, clean, current, and roomy. We used the beach chairs, ice chests, and other beach equipment that was provided with the condo. We love this place. Unfortunately we could only stay 2 nights here. I wish we could have spent the rest of our holiday here. The unit was very well appointed. The kitchen had everything that you could ever need. The appliances were top notch and the beds were so comfortable. The whole check in process was very smooth and well organized. The space and three bedrooms were perfect for my wife and I plus our three daughters. I would definitely stay here again. We had a lovely stay at this condo. It has all the things you need, fully stocked kitchen (minus the food of course) but they do have the basics, like olive oil, salt & pepper and some spices. There is plenty of room with three bedrooms and three baths. The patio has comfy furniture for watching the pool area or sitting around playing cards. And it's nice to have a garage to park your car. Plenty of beach chairs and toys to use too! Would definitely return. We had a lovely stay at the Princeville Condo 1221. Was clean, spacious and quiet. Loved having access to beach towels, chairs, snorkel gear, boogie boards. The kitchen had everything we needed. The pool is nice but chilly. The hot tub was perfect. We've stayed in a number of locations on Kauai over the past few years and found this condo to be a good value. We appreciated all the beach chairs and nice beach towels, as well as the condo itself. Our only complaint was that the pool got a little load some evenings when there were groups of younger people staying on the property. But, I would stay here again and would recommend it if you want to be on the North Shore. The condo was all we had hoped for, spacious and,clean. The kitchen is very well equipped and there are many extras for the beach in the garage. The lanai is amazing, overlooking the pool. Princeville is on the rainy part of the island so be prepared to drive south to go to the beach during the winter months. There is a great grocery store and little shops very close by. Another BBQ by the pool would help reduce wait times for the grill. The condo was wonderful. Very nicely equipped with all the amenities of home. My wife has been coming to the island for 15+ years, and she said there is no need to try and find another place to stay. We were very happy with the entire process and look forward to coming back January '14 for our anniversary. We had a wonderful time staying in 1221. Clean. Comfortable. Private and roomy for a family of four (two teenagers!). The beach extras in the garage made day trips easy and fun. Bbq was great and convenient. Called with one question and had an in-person solution within a few hours. Sooo thoughtful! Looking forward to a return trip! Mahalo! Our stay at condo 1221 was perfect. We had read so many great reviews about this condo and we were not disappointed. It was everything and more. We especially enjoyed relaxing on the beautiful lanai in the mornings and after a day of traveling around the island. The Princeville and Hanalei Bay area has to be one of the most beautiful places in the world. An exhilarating experience with a great home away from home! The service from first contact to leaving was great. The condo is first class. All amenities were supplied from the kitchen to the snorkeling gear. The only criticism I have is the BBQ area & Pool are located together. I think the BBQ area should be stand-alone with the addition of at least one more unit. We had a wonderful time in this condo. It was clean, well furnished, and, as others have stated, the beds were very comfortable! It was very peaceful, too! This specific condo is located in a quiet section and the lanai faces the pool, which was nice for us. The weather was beautiful and it only showered at night. The only downside was the stocking of the kitchen. We could have used more plates so we didn't have to wash after each meal and basic food items such as oil, Pam and seasonings. The garage had good beach accessories including toys, chairs, and umbrella. The condo exceeded our expectations! We stayed there for a total of ten nights. The pictures online were nice, but the condo itself was even nicer in person. There is plenty of room in this condo. The lanai was the best feature. After spending a long day playing outside it was nice to just relax on the huge lanai. It was also great having a washer and dryer as well as a full functional kitchen in the unit to keep things clean & tidy. The beds were over the top comfortable...beware you may find yourself hitting the snooze button often. The condo is nicer than my own home, and we can't wait to go back! All three couples agreed that this place had everything we wanted. Since we made all of our own meals, having a decent kitchen and enough dining area was important to us. The three separate bathrooms kept us out of each other's way. The complex was quiet and well cared for. The pool was lovely and we often had it to ourselves. Many beaches are close as is the Kalalau trailhead. There is also a nice walking trail nearby. If we come back to Kauai, we will stay here again. We had a great time in Kauai and the condo was perfect. Very clean, comfortable, and many amenities. We loved our condo 1221 in Princeville! Princeville is a lovely resort area with very nicely kept grounds. If you want a quiet getaway, this is the place! The condo was exceptionally clean and well stocked with everything from kitchen supplies to beach activities! It was so nice not to have to rent anything for our beach excursions..thank you! The condo is very accommodating for families and small groups as with 3 bedrooms and 3 full baths, we had plenty of room! The beds were very comfortable and the master bedroom and bath was amazing! We loved swimming in the pool at night after a full day of activities and dinner and we were usually the only ones in there! The workout room was great too. Hanalei town and Hanalei bay is not far away and a great beach for boggie boarding and swimming. I read every review before we stayed here and all the compliments people made were absolutely true! The only negative I read was to have maybe one more barbecue at the pool. We did not have that problem as we only saw one other person using it. This may be true during the busier times. All in all we loved our stay here and would recommend to all! My wife and I, along with three friends, stayed at 1221 for just under a week in May of 2011. The condo is clean, the kitchen is well stocked with cooking equipment, and the master bath is amazing. The lanai looks over a common green space with a pool. We spent many a night sitting on the lanai and enjoying the warm weather. We would definitely stay here again. Perfect condo for a family with kids. The place comes with everything from salt and pepper and aluminum foil in the kitchen to beach chairs/mats, beach towels, boogie boards and ice chest coolers in the garage for a day at the beach. It's ideal for families with small kids, as a pack n' play and a booster chair were provided to us upon arrival, and all of the electrical outlets were baby proofed. The beds were comfortable and there were plenty of towels for a family of six. The unit is also conveniently located by the pool. The management was very responsive when we had problems with the garage door opener and internet access; they fixed the problem within hours of our call. The overall property is ideally located, just 10 minutes from Hanalei Bay, and less than 2 miles from the St. Regis Hotel where we were attending a wedding. Two minutes away by car is Foodland, the main grocery store in the area, a great playground and the public library. I would highly recommend this place and particularly this unit. The road to the driveway of the condo dead ends so there aren't cars driving past your unit in the parking lot like the other condos on the property. My only suggestion for the property is to get another propane barbecue grill by the pool. Get there early to be the first on the grill, or you could be waiting in line for a while to cook your dinner. I loved our stay at this condo, and if we come to Princeville again, I wouldn't hesitate a second to rent this same unit. I highly recommend it. Plantation at Princeville 1221 is a gem just a short walk from the luxury St. Regis Princeville and postcard snapshot Hanalei Bay. Amenities of a top-notch resort but with a more relaxed feel, the condo is immaculately kept with fully stocked kitchen, laundry and bathrooms, upscale decor and furniture allowing for a relaxed Kauai stay at a reasonable price, especially given the high price of food and dining on the island. This is a gem especially for families that want a getaway in resort surroundings (upscale furniture, relaxed north shore address, large Roman tub and romantic master suite) yet desiring the comforts of home-- laundry, kitchen, lanai/enclosed patio, pool/barbecue area, wi-fi, etc. The condo is essentially new with very little obvious wear and obvious pride in ownership is evident in the surroundings and amenities inside. There are running trails leading to the waterfront and St. Regis resort (along the golf course) and Princeville shopping area/grocery store is a very short drive (about 3 minutes) or leisurely walk away. The condo was easy to access and the management company very helpful and accessible throughout our stay. Great location for a drive to the end of the road along the north shore. New to a condo vacation experience as we were? This is the one to try as you will come away with a fabulous vacation! Plantation at Princeville Condo 1221 - WONDERFUL!! We surely enjoyed our stay at the Plantation. A week flies by so quickly!! Very comfortable accommodations in every way. An item we saw for improvement would be another grill by the pool. There was a line every evening to use the one grill. A couple nights we ended up sharing it with another party. Hard to cook your meat as you like with someone else always opening up the grill. Also the man who lives under 1221 was not the most pleasant person. We just smiled at him when he complained of sand falling from our shoes off the steps onto his stuff. You live on an island for cryin' out loud. And, he complained that we were shaking the light fixtures as we walked or ran across the floor. Guess that goes with having someone live above you as we were not loud or rowdy in any way. Kristen is great!! Informed us well of the tsunami. Was gracious in allowing us a late check out as it worked out well with the incoming guests arriving after us. The condo is nicely decorated. The lanai is a super spot for kicking back and relaxing for hours. No regrets in choosing the Plantation at Princeville Condo 1221. My husband and our two kids (3 & 5) loved our stay Kauai. Our flight arrived late in the evening, and it was a pleasure unlocking the door and walking into the cool, welcoming and spotless condo. Amenities were more than expected and although we didn't need them, I was impressed to see there was plenty of infant/baby equipment stored. The kids made good use of the beach items in the garage too! The location was perfect for us. We had family staying at the hotel down the street. Foodland was only minutes away! It was also an easy drive up to Hanalei, or down to Kilauea or even Kapa'a. Anini beach was a great place to take the kids and also nearby. We loved our stay in the condo, and would have no problems booking again. The only "issue" we had was the fact that there wasn't the best sound proofing between the top and bottom floors of the condos. So the people below us could hear our kids playing above them. They were polite in their request to try to keep them from running around, but that wasn't really the problem. They were not overly loud and were not running around - there just wasn't the best sound insulation between the suites. Something to keep in mind if you are travelling with young children. Beautiful accomodations, wonderful weather, couldn't have asked for anything more...A true pleasurable vacation, and will rent again...Loved the house, the grounds, and pretty much everything...I can't say enough about how wonderful it was. Thanks for EVERYTHING!!! This is our second time at this location. I'm sure there other nice condo's in this complex however, we feel this is the nicest with the best location. Unit 1221 overlooks the pool with the soothing sound of the pool waterfall plus, it has a huge spa which many other locations do not have. The covered lanai is great when it rains and you can enjoy the rain on the comfy chairs pictured on the web site. After a long day at the beach it's nice to come back and relax at such a nice condo. The condo has very nice furnishings and the master bed is very comfortable. We'll be back. Aloha experience: Kristen is a very warm and welcoming reservations hostess, providing superior service through our stay. Special requests for grand-baby support (e.g., high chair, play pen) were cheerfully met. She also provided thorough info about our accommodations. Upon arrival, we were touched to find a thoughtful "welcome basket" containing chocolate covered and roasted macadamia nuts, a beach bag, Hawaiian coffee and potato chips, and several other items. Accommodations: very nice, modern, and spacious; a quiet location on the very best part of Kauai. Well maintained and clean. Many major amenities provided which, in our experience, are not always found in rentals in Hawaii: free internet, garage, etc. Also, many smaller items were stocked in the unit, like plastic wrap, aluminum foil, a handful of spices, food storage containers, an extensive collection of dishes, bakeware and cookware (we actually baked bread while there - OK, over the top! ), boogie boards, beach chairs, beach towels, etc. We saved a bundle by not having to buy (or haul) these items! The appliances are nice: side-by-side fridge/freezer with ice & water dispenser, full sized oven/stove and microwave, quality coffee maker, toaster and blender, dishwasher, etc. P.S. If Hanalei Bay is flat, try surfing at the Rock Quarry, about 15 minutes north. We found the place to very comfortable and hospitable. The Aloha Condos manager was excellent. We had slow draining baths and she was able to rectify the problem even on Sunday. The condo was well equiped. It even had ice chests for our daily excursions. Beach chairs and boggie boards came in handy as well. The complex was well managed...the pool area is well maintained. We found the complex to be quite relaxing. The only thing we noticed is that we wish it had more AC ducts to provide better/even distribution. Though it was very minor and not many of us complained. We really enjoy our vacation and the accommodation is a big part of it. We highly recommend this to anyone. The condo and facilities were faboulous. Beautifully maintained and appointed with everything that a couple or family could need. They provided everything from trash bags to laundry soap for the first couple of washes. Kristen is a delight to work with and gets right back to you if you have questions or concerns. The location is quiet and peaceful. In the evenings take time to stroll to different areas throughout the Princeville neighborhood to watch breath taking sunsets. Sit out on the Lani and enjoy the sound of the pools tranquil waterfall and the cool breeze. But be careful.... I can guarantee that you will catch yourself drifting off to sleep before you know it. I can't recommend this place enough. Great people, wonderful location and facilities that have all the conviences of home. Maybe that's why they call it paradise. The condo was located in a beautiful place, with a beautiful view and was decorated wonderfully. Even as spectacular as Kauai is, we always looked forward to returning to the condo. It feels like a home, a big kitchen with everything you need to make anything from breakfast to dinner, the beds are very comfortable, bathrooms are large & include hair dryers that actually work great (a plus not to have to pack). It was also very clean (complaints others had at the same location). The patio is large with lots of seating. The pool is very nice with large bbq's to grill. We were there for a wedding and can't wait to return with my entire family. The price of the condo was amazing too, we had no idea it was going to be as great as it was. I have worked on 5 star hotels for a long time and this was just as good. I love being able to cook our own food with the fish markets so close. The condo is located in beautiful scenery and i loved taking early morning walks. In the garage there are lots of beach toys, coolers, chairs and even boogie boards. I highly recommend THIS particular condo, all our other friends were very jealous (they were on the same property). You will not be disappointed! My wife and I stayed here for our honeymoon and we could not have been happier. Our stay was care free. The condo had everything we possibly needed. Every aspect of the condo made us very comfortable. The layout was spacious and the veranda was the perfect place to cap off each evening. It's the first time we stayed on this side of the island and we loved it. We were in the heart of Princeville and if we wanted, we could take a short drive north into Hanalei. We had a wonderful vacation and we look forward to returning here again. Beautiful Condo on a Beautiful Island! We had a perfect vacation on Kauai and staying in this beautiful condo was a big part of it! Anything that we could possibly need was in the condo, the amenities were exceptional. This condo was perfect - clean, beautiful and comfortable! After a day exploring this amazing island, it was nice to be able to come back to this condo - either soak in the hot tub or sit on the comfy lanai. Aloha condos was great to work with, it was nice to know that Kristen was available to assist if anything may have come up! (Nothing did, of course!) Kauai is my favorite place, I love this island! I HIGHLY recommend this condo for your stay, you will not be disappointed!! This was my first 'condo rental' experience, and I can't imagine a better first time. When I walked in the door, I was ecstatic to find that it looked exactly as it did in the on-line pictures; and all the rooms were in pristine condition. It also had the best supplied kitchen I've ever seen. Not only did it have a sensible variety of dishes, knives and pans, but it had things like plastic wrap. That's just brilliant! We had 6 people in our group ranging from my 8 year old son to my 88 year old mother, and everyone loved the condo. My boy loved the flat panel TV/cable, and my mom loved the comfortable seating and 'flat' living space.If we return to Kawaii, I wouldn't hesitate to stay at this condo again. We stayed in this unit with 2 other adults for a wedding of some dear friends, making it 4 of us in 3 rooms. We were lucky enough to get the master- and it was FANTASTIC! I wish I had a master bath in my house like this unit! So tastefully done in tile and beautiful fixtures, and the linen and bedding was so nice, I went right out and bought new linen for my vacation rental on Maui!!!! The owners really went the extra mile with upgraded furnishings, window coverings, appliances and wireless internet too. It was spacious, comfortable, and really felt like a true 'home' base. Why this unit even has a GARGAGE!!! I usually pine for an oceanview, but with the upgraded features of this unit and the lovely garden view, I really did not miss seeing the ocean, we just enjoyed it more when we headed down to the beach, which ws not far away at all...and stayed a bit longer... and once we got home, we flopped into our luxury bedding and felt like home. MAHALO nui LAO for creating such a nice space, for such an affordable price. Oh and by the way, the local on island agent was wonderful too, she stopped by personally and helped us sort out a few things we needed in very short order. We had a wonderful time and the condo was fantastic. We are rather picky and were worried about how nice it would be once we arrived. But, it was exactly like the website showed; beautiful furnishings, clean everywhere, and a rather large lanai to lounge on after a long day at the beach. Princeville is so beautiful and this condo was equally beautiful! We would definitely stay there again. We enjoyed our stay in this spacious and lovely three bedroom, three bath condo. It was walking distance from a beautiful beach and to Princeville Villege. Every morning we had an Hawaiian breakfast on the Lanai, it was a beautiful extension of the living space. We had a exceptional time in Kauai! This property was BEAUTIFUL/COMFORTABLE/CLEAN. It was such a great choice. I HIGHLY recommend it. It was nice to be able to have the amenities of home but still feel like you were on vacation. Aloha Condos was a pleasure to work with and especially Kristen the property manager. What a pleasure to work with such professional people. The chairs on the patio are as comfortable as they look in the photo. What a joy it was to come back to this condo after a long day sightseeing or a day at the beach. Overall we had a fantastic vacation and look forward to coming back again and again and using this same property.